On Tuesday we saw a list of plugins to prevent Spam Comments. But Spam isn’t the only thing bloggers have to deal with. They even have to deal with negative comments. Some deal with it, in a counter-attacking way whereas others deal it in a very soft manner. Now which is the right way to deal with such negative comments ? The answer to this is not certain, because a lot depends on the comment as a whole. Whether it is an all out personal attack, critical reading or just trying to demoralize you. Personal Attackers ~ Here the Commentator will personally attack you. His whole focus will be regarding your habits, your looks, etc. Personal Attackers are mostly non-acquaintances because they know something about you & that’s the reason they attack you. Critical Readers ~ Critical Readers are the one’s who read the post to just point out your mistakes. They’ll point out too many spelling mistakes, formatting errors, grammatical errors, etc. in just a single post. Demoralizers ~ This category of commentators mostly comprises of bloggers who comment on other blogs just to demoralize them. Let’s figure out the 3 Ways to deal with such negative-energy-filled comments. Why would a blogger waste his energy trying to reply to a negative comment. Rather you can just hit the Trash button in your WordPress dashboard. 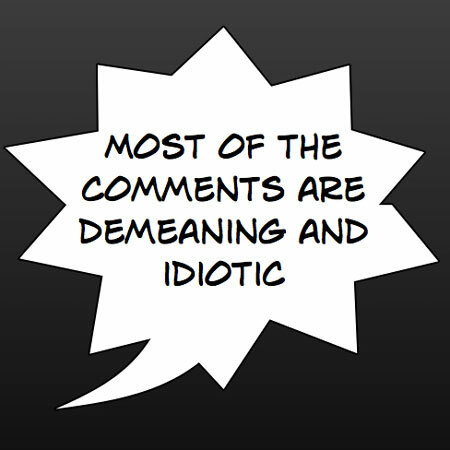 Sometimes ignoring negative comments will stop the commentator from posting a comment. He’ll think twice before he posts a comment the next time around. Sometimes you just can’t ignore people & their comments. So you tend to reply. While typing your reply you must remember not to go down below your dignity levels. Try to solve out the matter by contacting that person. Also, mention that you sent a mail to him in your reply. Why don’t you join an editors job ? Always try not to get down to their (i.e. the Commentator who posts Negative Comments) levels & abuse them. I’m thankful to my readers & commentators that I didn’t have to deal with Negative Comments till now. How do you Deal with Negative Comments ? Make you point clear and reply politely is good way to respond to negative comment. nice post. Hey Mani! I don’t get too many negative comments on my blog but last week I got some that I will call “annoying”. What I mean is that the commenter is a blogger that I know pretty well but the comments did not relate to the post. I agree that you should allow negative comments as long as they aren’t spammy – and I never allow profanity. Thanks for the post Mani. Whatever the comments may be we need to handle it in a soft manner. I think proper negative comments will definitely help us to grow. I think is best to deal with the comments in a soft manner. You are right to deal with such a commentator. What to do and how to deal with spammer who write appreciation in such a manner that some time i am little bit confused, Whether they are spam or real. There is a 4th category of negative comment that deserves mention: negative comments that are actually attempts to start a dialogue converning percieved shortcomings in the content of a blog post. These should be cherished because they tend to be longer, more articulate, more insightful, and a valid contribution to the subject under discussion. It takes passion to go to that much effort – and that shows that they care what you have written. So such negative comments are actually a compliment and should be treated as such.